Can I strip a mechanic’s lien from my property when I file bankruptcy? In a chapter 7, definitely not. In a Chapter 13, maybe. In other words, you can strip a judicial lien is there is no equity in your home to secure that lien after your homestead exemption is considered. So, if you house is worth $100,000, and your mortgage is only $70,000, then you have $30,000 of equity. However, your homestead protects that $30,000. So unless a creditor can prove that the house is worth more than 100k (70k +30k), his judicial lien can be stripped, because there is no equity to secure it. Not, however, that this only says “judicial lien.” A mechanic’s lien is a lien arising out of statute, and a chapter 7 won’t let you strip that. If you want to strip a mechanic’s lien, then you’ll need to file a chapter 13. In a chapter 13, you can avoid liens, like a mechanic’s lien, if there is no equity in the property that secures that lien. The calculation above is the same. The only difference is that you have to file a Chapter 13 to get rid of it. This entry was posted in Utah Bankruptcy on July 17, 2014 by robertspaynelaw. 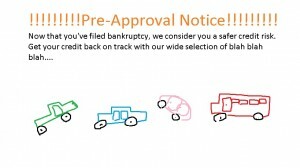 Is it hard to finance a new car after I file bankruptcy? Just don’t make the mistake of rolling the negative equity of your current financed car into a new loan. Then you’re simply adding bad, dischargeable debt onto your new loan. If you filed a chapter 7 today, you would start getting 2-3 car loan applications and credit card applications in the mail by the end of the week. Now you’re a safe bet, because if you get a discharge in this case, you won’t be able to get a discharge in another chapter 7 for 8 more years. 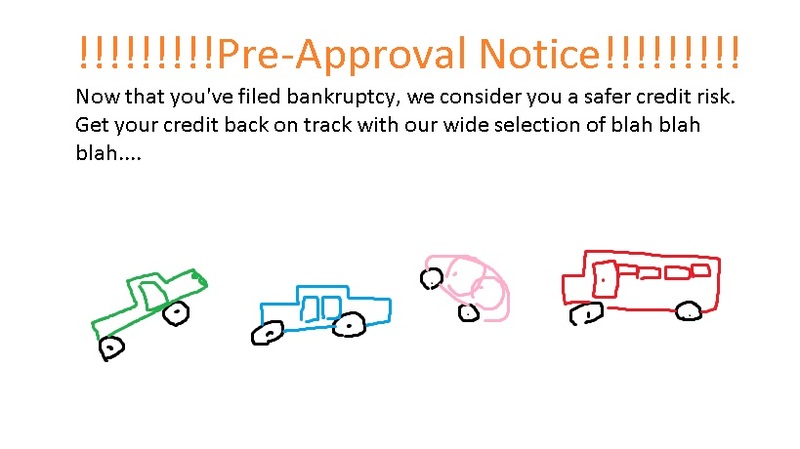 So right after filing a chapter 7 bankruptcy, you’ll get lots of car loan applications saying that you’ve been approved. However, you’ll generally have to buy a newer car with low miles, and the interest rate will be somewhere in the +25% interest range. If you can just hold out with your current car until you receive your discharge (about 3 months after we file), then the interest rates will drop to +15%, which is bad but not nearly as bad. Even better, if you have parents or even grandparents who can finance the car solely in their names, then the interest rate will be wonderfully low. (However, if Mom and Dad or Grandma and Grandpa asked me if it was a good idea to finance a car for someone else, I would tell them, “NOOOOOOO!”). So in a chapter 7, someone will finance you, somewhere, virtually right away. That being said, I’d advise driving a non-financed beater for as long as you can. Insurance is cheaper and you don’t have ongoing car payments on a car that will eventually get older. In a chapter 13, it is hard to finance a car. I have covered this elsewhere in the blog, but basically, you need to get court approval for your car purchase. This means that you need to find a car, sign the loan paperwork, and then your attorney files it with the court and you wait 30 days for approval by the court. After jumping through these hoops, your attorney can file an application with the court for more fees from your chapter 13 plan, and the dealer may not be willing to wait for you to get court approval. This entry was posted in Utah Bankruptcy on July 16, 2014 by robertspaynelaw. I had a client who was planning on surrendering his car in bankruptcy. 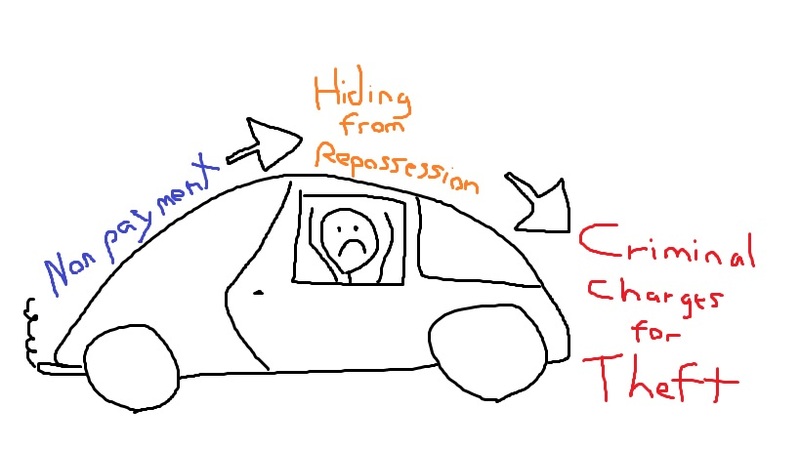 We listed the car and the secured loan in the bankruptcy and then listed on our Form 8: Chapter 7 Debtor’s Statement of Intention that he intended to surrender the vehicle (give it back to the creditor). About 4 months after we filed the case, the creditor called me and said that he hadn’t made the vehicle available for pick-up. I called my client, and he told me that he had moved out of state and was still driving the car. He would turn it over eventually, but in the mean time, it was cheap transportation. He wasn’t making the car payments, but he knew that they wouldn’t be able to track him down in another state. I told him that this was a bad idea, and he needed to turn it over immediately. When we file bankruptcy, we list your intention for financed cars/trucks/boats/atvs under a section called “Statement of Intention.” When we meet with the bankruptcy trustee about a month after we file the case, he orders you to follow-through with your intentions in the next week. If you fail to turn over property within a reasonable time, the creditor has every right to turn you in to the police for criminal prosecution for theft. Some states have laws which prevent you from hindering a secured creditor, but Utah is not one of them. Here, the creditor must rely on the state theft statute. 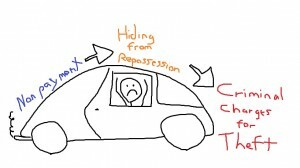 Utah Code 76-6-404 defines theft as “A person commits theft if he obtains or exercises unauthorized control over the property of another with a purpose to deprive him thereof.” In other words, you have surrendered the car in your bankruptcy. If you refuse to turn it over, you are exercising “unauthorized control,” and you could be subject to criminal actions. In short, turn over the vehicle when the trustee tells you to. This entry was posted in Utah Bankruptcy on July 15, 2014 by robertspaynelaw. I have to go to a 2004 exam in my bankruptcy case. What is it? It’s a deposition. This is kind of like what you see on tv. You will sit at a table with your attorney, and another attorney will ask you questions under oath. Your attorney may even object to the format of some of the questions. The main difference is that nowadays we use tape recorders instead of court transcriptionists, so there won’t be a stern looking lady in the corner watching you and typing out your every word. At the 341 Meeting of Creditors, the bankruptcy trustee usually takes less than 10 minutes asking you questions on your case. He then gives creditors an opportunity to ask you questions, but only for a few minutes. If the trustee or one of your creditors wants to ask more in-depth questions, they will schedule a 2004 exam. I have quoted the 2004 rule below, but it is basically a bankruptcy court deposition. If the trustee wants clarification on a more complicated issue in your case, he’ll schedule a 2004. If he thinks you may be committing fraud, he’ll also schedule a 2004. Creditors usually schedule 2004 exams because they are litigation attorneys fishing for answers from you that may allow them to file non-dischargeability adversary proceedings (bankruptcy court lawsuits). If they can get statements from you that you were attempting to commit fraud when you took out loans from their clients, they’ll sue. However, this is very hard to prove. You will definitely want an attorney with you for the 2004 exam. If you filed your bankruptcy case on your own, please hire an attorney for this portion. It is normally boring and non-productive, but you’d hate to mess up here. This entry was posted in Utah Bankruptcy on July 14, 2014 by robertspaynelaw. Yes, but unless you were really trying to commit fraud back when you applied for the loan, you’ll probably be okay. In deciding the dischargeability of a debt arising from a “stated income loan” under 11 U.S.C. § 523(a)(2)(B), the Court found that the evidence presented confirmed the Debtors’ statements that their income listed on the loan application was correct and the creditor failed to carry its burden of proof. Further, an inadvertent mistake on a confusing form was not sufficient to prove the Debtors had an intent to deceive the creditor. Finally, a debtor’s representation cannot be the sole basis upon which a creditor can reasonably rely because a creditor has a duty to ensure some basis exists for relying upon the debtor’s representations. Self-developed procedures that excuse reasonable reliance cannot insulate a creditor’s claim from discharge. In other words, the bank couldn’t justify its reliance on a stated income loan without having reasonable measures in place to verify income or statements on the loan application. What this means for you is that if you had a stated income loan back in the day, the odds are pretty good that you won’t be sued on this loan application, unless you really did commit fraud with false documents or some other kind of false statement (that the bank can prove). This entry was posted in Utah Bankruptcy on July 3, 2014 by robertspaynelaw. Will my payday loans keep deducting auto-pays from my bank account after I file? Probably yes. They are not supposed to do that, but they probably will unless you take affirmative steps to stop them. The moment we file bankruptcy, the court assigns you a case number, and everything stops. The court issues an Automatic Stay that stops any creditors from collecting on you. It stops garnishment, foreclosure, repossession, etc. This should stop your payday lenders from cashing those post-dated checks or from taking automatic withdrawals from your checking account. Unfortunately, the payday lenders are smart enough to drag their feet on cancelling those auto-withdrawals. I can send a demand letter to get the post-petition monies returned to you, but it takes time. And although the automatic stay stops collections efforts, I have a hard time stopping you from voluntarily paying back those creditors through autowithdrawals that you have authorized. So what do you do: contact your bank and cancel those previously approved autopays or autowithdrawals coming out. It would be nice if the bankruptcy could automatically notify the court and stop all electronic transactions, but it doesn’t. You need to take some stops to stop those payments as well. This entry was posted in Utah Bankruptcy on July 2, 2014 by robertspaynelaw. Can a creditor enforce a civil arrest warrant or bench warrant against me after I file bankruptcy? That being said, bankruptcy may wipe out (discharge) the underlying debt (the judgment), but you will most likely have to pay the fine associated with the bench warrant. There is a wonderful case from 2001 called In Re Goodman, 277 B.R. 839 (Bankr. M.D. Ga. 2001), which discusses in detail whether or not a creditor can use a civil arrest warrant against a debtor after the debtor has filed bankruptcy. Short answer: the automatic stay stops ANY collection efforts, including the bench warrant. The automatic stay, which goes into effect upon the filing of a bankruptcy petition, serves as broad protection against interference with the bankruptcy estate. Among its effects is to bar “the enforcement, against the debtor or against property of the estate, of a judgment obtained before the commencement of the [bankruptcy] case.” 11 U.S.C. § 362(a)(2). However, it does not apply to “the commencement or continuation of a criminal action or proceeding against the debtor.” Id. § 362(b)(1). Therefore, the first step in this analysis is to determine whether the arrest warrant in this case was criminal or civil in nature. The warrant in this case is in the nature of civil contempt. A contempt order that allows the debtor to purge himself of contempt, as the warrant here does, is civil in nature. In re Maloney, 204 B.R. 671, 674 (Bankr.E.D.N.Y.1996). Also supporting a conclusion that the warrant is a *842 civil contempt remedy are the facts that “it was initiated by a private party, to coerce the Debtor’s compliance with his duty to provide discovery responses.” Atkins v. Martinez (In re Atkins), 176 B.R. 998, 1007 (Bankr.D.Minn.1994). As a civil contempt remedy, the arrest warrant would appear to fall within the scope of Section 362(a)(2). 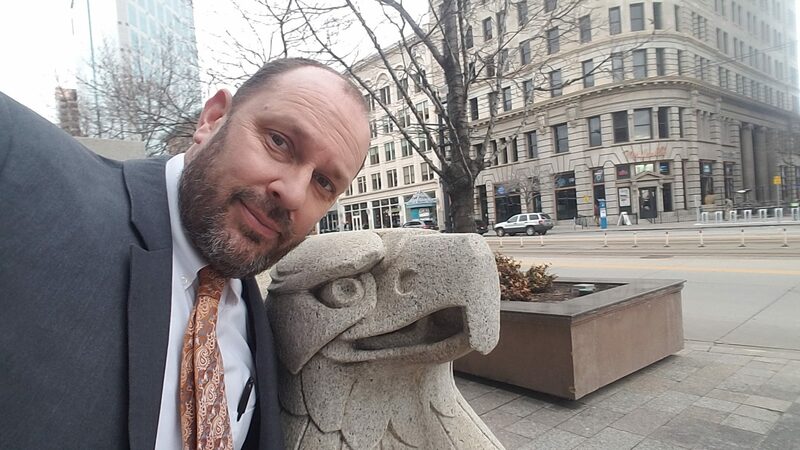 However, some courts have held that the civil contempt penalty in question was issued to uphold the dignity of the court and therefore was not stayed in bankruptcy. Stovall v. Stovall, 126 B.R. 814, 816 (N.D.Ga.1990); Rogers v. Overstreet (In re Rogers), 164 B.R. 382, 391-92 (Bankr.N.D.Ga.1994). The warrant in this case specifically states that it is issued for that purpose. But it is also being used as a coercive tool to enforce a judgment, as evidenced by the fact that Debtor could purge himself of the contempt by complying with the March 27 order. See Siskin v. Complete Aircraft Servs., Inc. (In re Siskin), 231 B.R. 514, 519 (Bankr.E.D.N.Y.1999). The very fact that it was issued at Albany’s request also suggests that its purpose is to enforce a judgment. Mitchell Constr. Co. v. Smith (In re Smith), 180 B.R. 311, 319 (Bankr.N.D.Ga.1995); Atkins, 176 B.R. at 1006. Albany would have this Court dissect the purposes behind the warrant and hold that to the extent it is used to force Debtor to comply with their efforts to enforce a judgment, it is controlled by the automatic stay, but to the extent it issued due to Debtor’s disregard for the authority of the superior court, the automatic stay does not apply. However, these purposes are inextricably intertwined and cannot be severed. Debtor may purge his contempt and avoid incarceration by answering interrogatories and paying the attorney fees. Albany’s position would require Debtor either to forego the option of purging contempt or to forego the protection of the automatic stay. Therefore, even if the warrant were based on Debtor’s disrespect for the superior court, it is still being used as a collection device. As a result, the Court concludes that the arrest warrant is covered by the automatic stay. The automatic stay goes into effect by operation of law, so it is not the Court’s responsibility to issue a duplicate injunction to prevent execution of the warrant. The burden is on the creditor to ensure that it does not violate the automatic stay. Smith, 180 B.R. at 319. The Bankruptcy Code provides a remedy to Debtor if Albany fails to meet its burden. 11 U.S.C. § 362(h). Therefore, Albany must take steps to ensure the warrant is not executed. Siskin, 231 B.R. at 519 (finding that the creditors “had an affirmative obligation to ensure that the outstanding Warrant of Arrest was not enforced”); Smith, 180 B.R. at 319 (finding the creditor in violation of the automatic stay due to *843 its failure to act to nullify a contempt order). In conclusion, the Court holds that the automatic stay prevents execution of the arrest warrant issued by the superior court for Debtor’s civil contempt because it was issued to aid in the collection of a judgment. Therefore, a permanent injunction is unnecessary. Furthermore, as the creditor seeking to collect that judgment, Albany has a duty to take affirmative steps to ensure that, so long as the automatic stay is in effect, Debtor is not arrested under that warrant. This entry was posted in Utah Bankruptcy on July 1, 2014 by robertspaynelaw.